Ghana continues her preparations for June's World Cup qualifiers on Wednesday with friendly matche against Angola. Ghana coach Mariano Barreto has called-up a predominantly home-based squad. 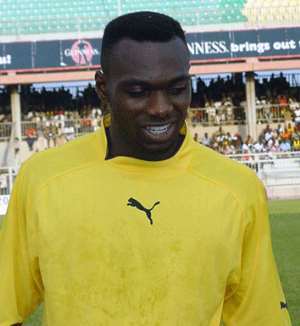 The only overseas-based players are Ajax Amsterdam's Anthony Obodai and John Mensah (pictured) of Italian Serie A side Modena. Stephen Appiah of Juventus, Sammy Kuffour of Bayern Munich and Olympic Lyon's Michael Essien have not been included. Barreto told BBC Sport that he left the players out so they could concentrate on their club commitments. 14-locally based players hsve been called for the game. Asante Kotoko has six call ups namely Louis Quainoo, Aziz Ansah, Dan Yeboah, Joe Hendricks, Arhin Duah and William Tierro. Players of Hearts of Oak who would be expected to join their colleague when they return from Angola are Sammy Adjei, Lawrence Adjei, Kwabena Boafo, Ablade Morgan, Adjah Tetteh and Dan Quaye. Hamza Mohammed and George Eranio of King Faisal and Berekum Arsenals are the other players called up. The match will act as a warm up for both teams who start their World Cup qualifying campigns in June. Ghana meet Burkina Faso in their first qualifier while Angola face Algeria.